We expect Moody’s to maintain current rating. The deterioration of institutional quality assessment is likely to be benign without a significant drop in the score. On the other hand, the macroeconomic and fiscal outlook should improve. Monthly activity data (production, retail sales) should support a strong GDP reading close to 5% year-on-year also in 1Q18. Russians head to the polls this weekend to choose their next President for 2018-2024. There is no intrigue over the winner, but the PM chair, composition of the cabinet and its ability to push through Putin's recently announced priorities remain unclear. 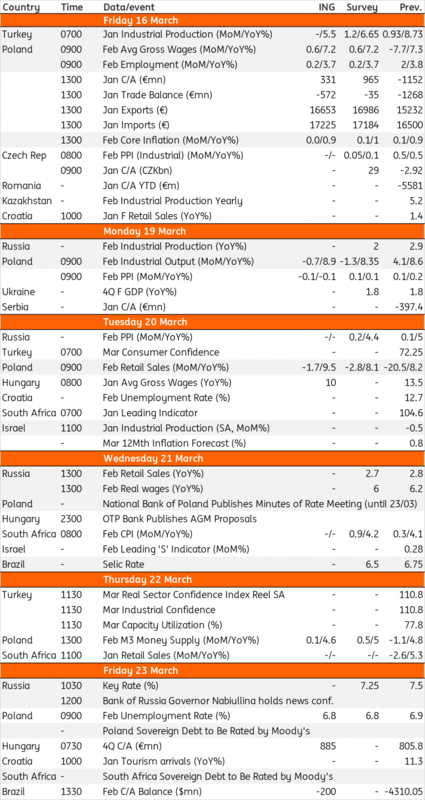 There will also be a slew of February data including retail sales which should reaffirm the story of growing domestic demand as well as the Central Bank of Russia meeting, where we expect to see a 25bp rate cut as the base-case scenario. We expect falling inflation expectations to prompt the central bank to extend the rate cutting cycle next week. Much of the market focus next week will be on the post-meeting statement, specifically on whether the central bank will keep the door open to further cuts, or close it more firmly this time. Given the potential for continued downside surprises on the inflation front, it's possible the Bank maintains the current guidance, which states that the base-case scenario would be consistent with no additional rate cuts. But cuts will be considered if the inflation outlook (once again) surprises to the downside.